This text was developed for the AAPM’s 2011 summer school in Burnaby, British Columbia. 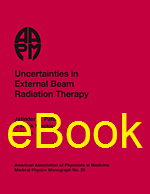 The focus of the summer school was to (a) understand the potential sources of dosimetric uncertainties in radiotherapy, (b) evaluate the impact of these uncertainties on the accuracy and conformity of dose delivered to patients, (c) understand strategies for mitigating these uncertainties, and (d) understand the impact of these uncertainties on QA/QM. The images in this eBook are in color.